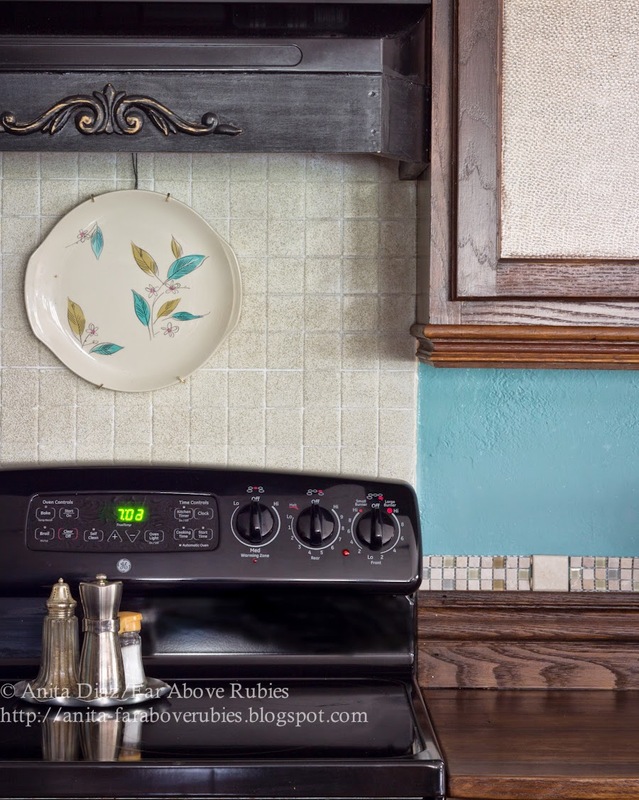 Far Above Rubies: Solving the backsplash issue...for now. I mentioned a couple weeks ago I was trying to finish up some projects that needed finishing, and the kitchen backsplash was one of them. 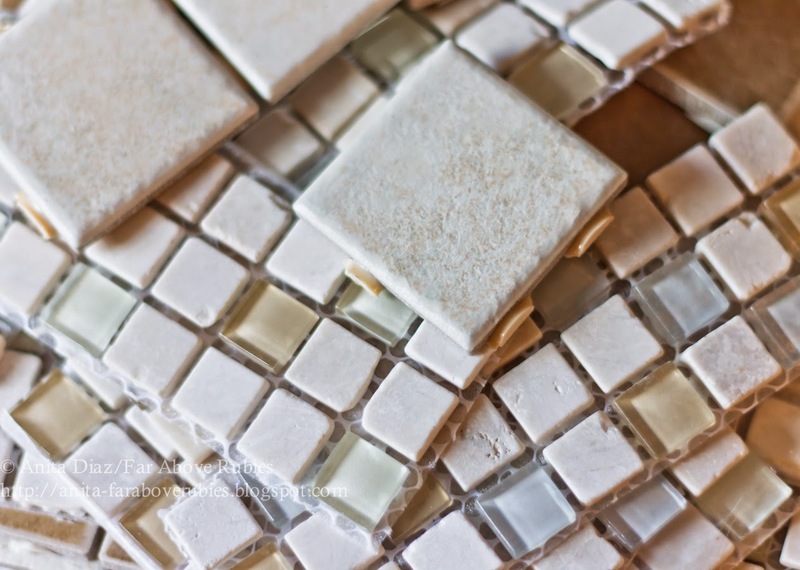 I had found this mixed mosaic tile last year at Lowes that I LOVED, but of course there were only two 12 x 12 pieces, and no more anywhere. You can read about my dilemma HERE. It dawned on me that part of my issue was the difference between the brown tiles and the mosaic, which had more light tiles, so I decided to do what I did to the countertop to tie it all together. First, I primed with Kilz, then painted a coat of satin trim paint in BHG "Sunlit White." I then taped everything off, put drop cloths over everything and spray painted the tiles with Rustoleum American Accents Stone textured paint. 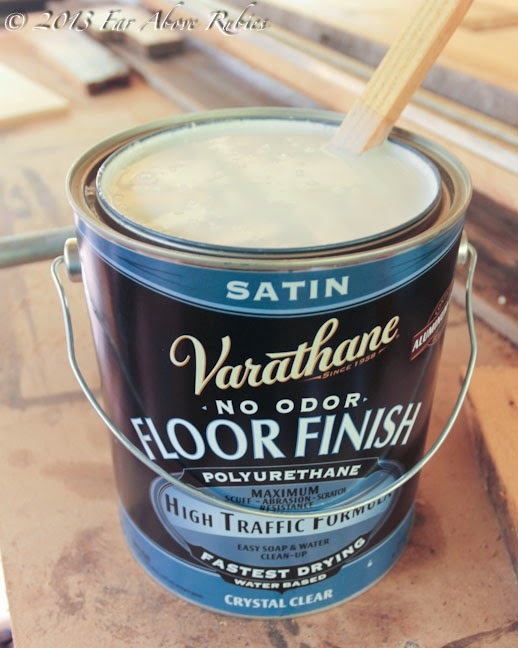 I let that dry, then sanded it down carefully and applied a couple coats of the same Varathane floor finish I used on both the wood and painted countertops. I then applied grout over the entire surface. Voila...so much better than the dark brown tiles before. 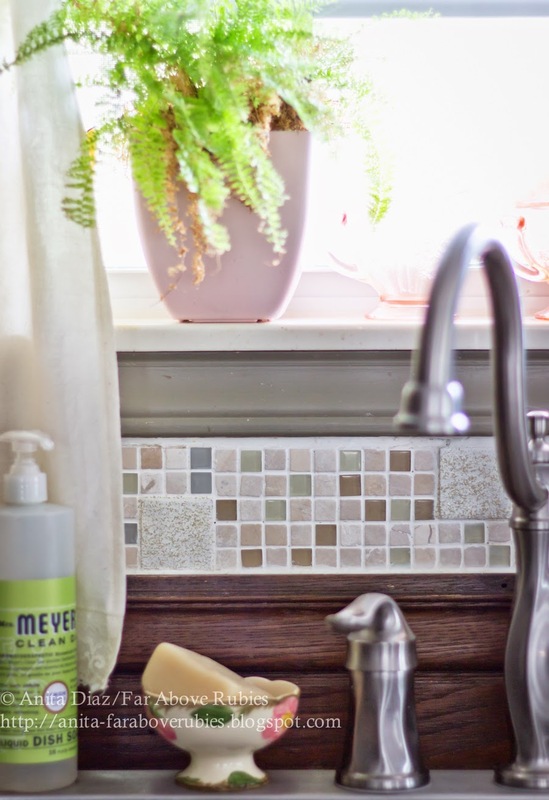 I also painted the five brown tiles I had mixed in with the mosaic over the sink. I had bought some small ceramic tiles in this lighter color, and the painted ones are hard to distinguish from the bought ones. So now, my dilemma is whether to continue the tiles along the entire backsplash. I only have enough of the mosaic tiles to do a border mixed with the cream ceramic tiles, but I'm not sure I want to do that after all. I just have the tiles propped up now for inspiration. We'll see. At least I can live with it better this way. On another note, thank you all SO very much for your thoughts, prayers and well wishes for my husband. It made him feel better to know so many people cared. He actually started to feel a little improvement today, so that is encouraging. He is trying to take it easy and one day at a time. I'm just thankful it was not worse. I love your solution! 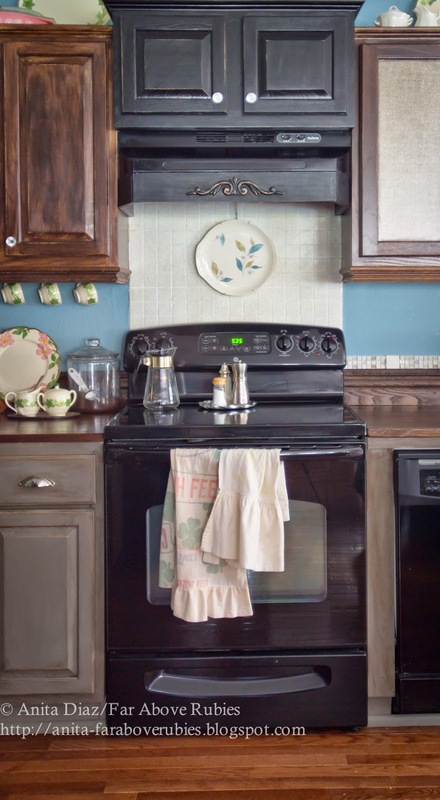 I am currently staring at a backsplash-less kitchen and can use all the inspiration I can get. You come up with such inspiration! I've had your 2012 Lilacs for Easter tablescape up all afternoon. Pinned it too. 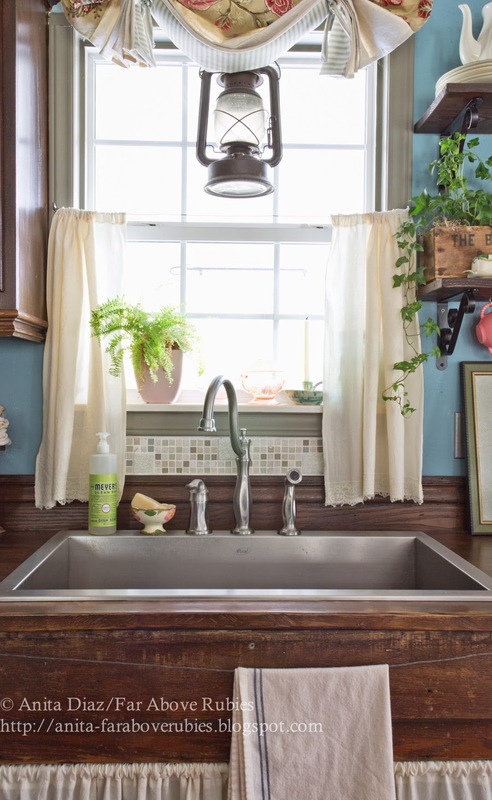 Also, your kitchen counters made from the old wood are such treasures. I always dreamed of wooden countertops. Your blog is stunning and your heart for the Lord such a blessing. May the Lord continue to bless Luis with full, complete and uneventful recovery! I'll be your newest follower. I love it, you always come up with such fabulous resolutions to problems. Looks great. What a splendid solution. Looks really great Anita. Thanks for the update on Luis. Continued prayer for his speedy and complete recovery. Very clever - and brave! It looks wonderful. wow, great job. love those mosaic tiles. Isn't it interesting how our limitations help us to see new possibilities? 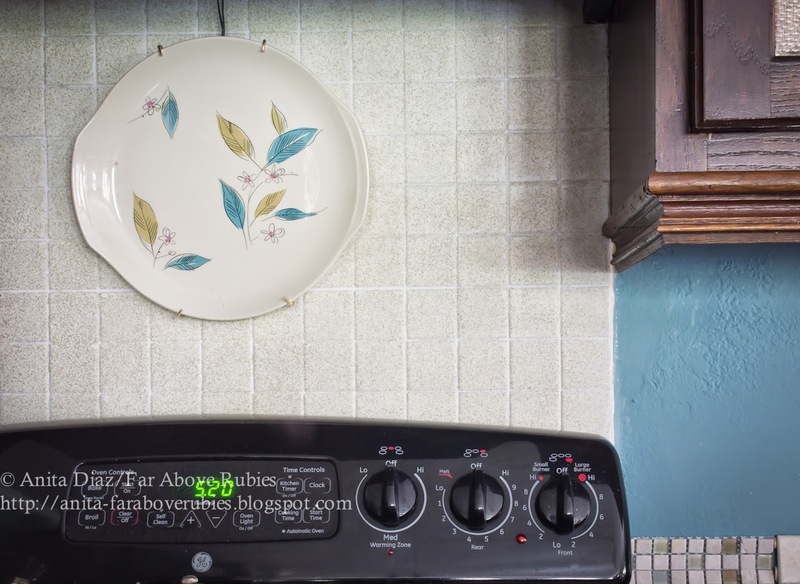 Anita...I really like the new lighter look of the tile behind the stove. I'm also interested in the polyurethane. The can says crystal clear. Most add a yellow cast, especially noticeable when applied to light colors. Is it really clear? That just might be the answer for a project I haven't finished. Thanks!